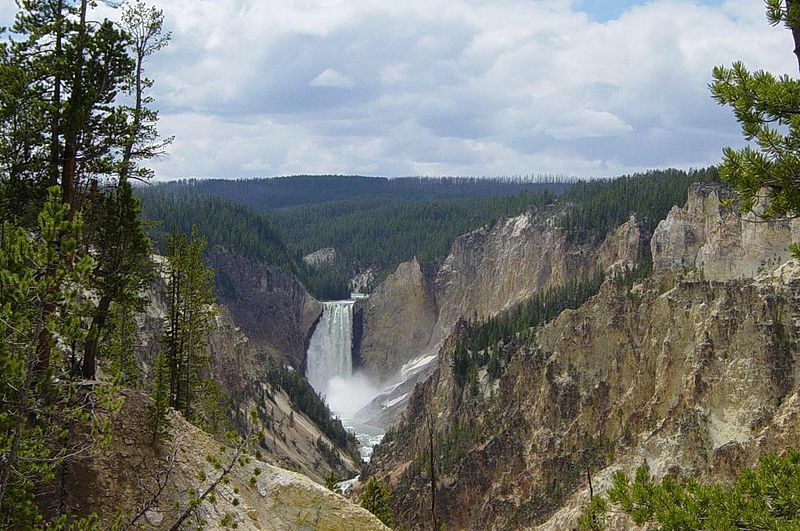 View of the Lower Yellowstone Falls, eroding through volcanic deposits. Photo by Daniel Mayer and released under terms of the GNU FDL. Wikimedia commons. Yellowstone is a huge volcano that isn’t thought to have erupted any magma in the past 10,000 years – though it has had some large ‘hydrothermal’ explosions (of steam and mud) in the past few thousand years. Yellowstone is a caldera volcano, that has had three very large explosive eruptions in the past 2.5 million years (the Huckleberry Ridge Tuff, 2.1 million years ago; the Mesa Falls tuff, 1.3 milli0n years ago; and the Lava Creek Tuff, 640,000 years ago). The present day caldera is approximately elliptical in shape, and is 85 km long and 45 km wide. The geological setting is ‘intra-plate’, with the volcano forming as a consequence of the rise of magma from a deep, hot upwelling region in the mantle. How does Yellowstone stack up as a Top Trumps Volcano? Last known eruption: a magmatic eruption has not occurred for at least 10,000 years! Yellowstone is one of the ‘better’ cards in the pack – given its size, and potential for destructiveness. However, no-one is known to have died in an eruption of Yellowstone, so its deadliness is zero! Explosivity (Volcanic Explosivity Index) – 8. Top of the scale – Yellowstone has had three of the largest eruptions known over the past 3 million years; only beaten by Toba in Indonesia, which erupted about 74,000 years ago. Each of these three eruptions deposited ash across a vast area of present-day North America. Height – 2805 m. Yellowstone sits high up on the Yellowstone Plateau of Wyoming. Deadliness – 0. Yellowstone is not thought to have had a magmatic eruption in the whole time that humans have lived in North America. Wow factor – 34. Yellowstone covers such a vast area that the sheer size of the volcano is best appreciated from space! Unpredictability – 34. The eruption history of Yellowstone is still not completely known, but there is no reason to suspect that it might not have a large explosive eruption again at some time in the (geological) future. Devastation Potential – 949. Considerable – a repeat of any one of the 3 largest eruptions would be calamitious for the United States, and would have severe global economic consequences.